When you are renting out your properties, such as your house, you must ensure that you have house rent receipts prepared. Having such documents makes it easy to issue should the tenant requests for one. It also makes it easy to keep track of the payment of the tenant and you are also able to keep a record of all the payments that have been made. Once this document has been issued, it means that both the tenant and the landlord understand the payment terms that was agreed on. There are five Sample Receipts that can help you out with your rent receipt issuing dilemma. These are pre-designed to have all the necessary information be easy to lay down. Browse through our samples below. Being a landlord comes with its own set of responsibilities. One of these responsibilities is being able to issue a house receipt when a tenant pays his monthly rent or when he requests for one. Listed down below are the information that is essential to every house rent receipt. You should always include the date when the tenant paid his or her rent and the date when the receipt was issued. 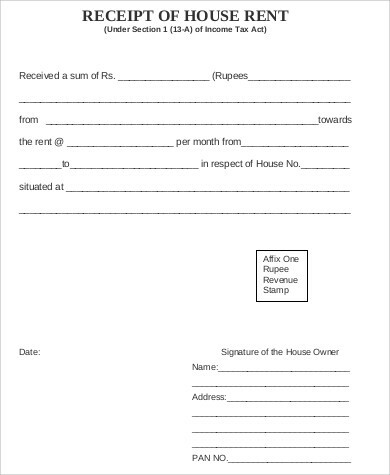 The complete address of the house should be included in the receipt. The total amount due for rent, what the payment covers, and the specific time period covered by the payment. Should there be any balances, this should also be stated in the receipt with its due date. The mode of payment used by the tenant. Landlord’s complete name or the name of the person who received the payment in cases where the landlord is not around to personally receive the payment. 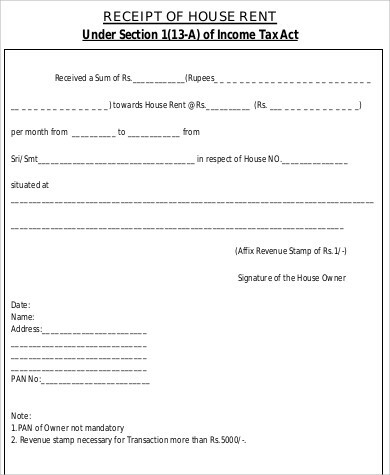 All important information should be stated in the house rent receipt to avoid any misunderstanding. Two copies are needed every time these are needed to be issued, one copy for the tenant and one for the landlord. The remaining balance and other fees should be reflected in the receipt. 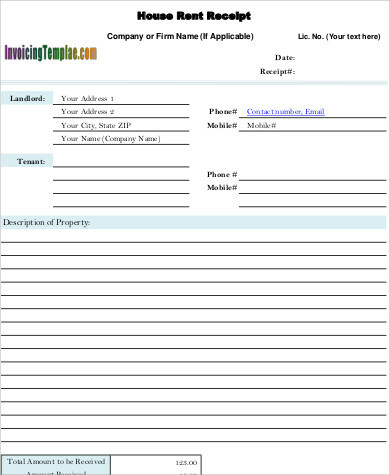 You can also take a look at Sample Rent Receipts. 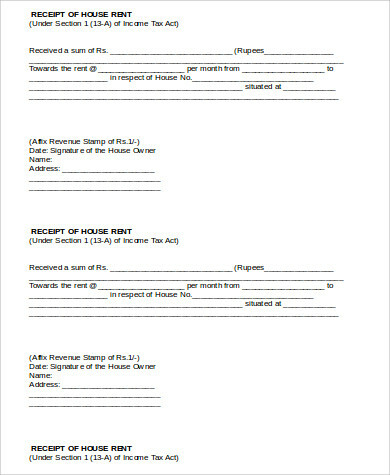 House rent receipts keep a record of all the rent-related monetary transactions between a landlord and a tenant. As a responsible landlord, you should be able to issue a house rent receipt to your tenant if they request for one or when they make their payments. In issuing these documents, you can just simply write the necessary details in a blank piece of paper. However, you want to be seen as someone who is organized and professional. This is why using the templates in this article can help make your receipt look top-notch and formal. To make use of the templates in this article, you need to first choose one that is most appealing to you. Take into consideration what is appropriate for you and your tenants. Once you have chosen a template to use, you can click the green Download button beside the document. These documents are highly editable since they are PDF (.pdf) and Word Document (.doc) files. You can easily customize these according to your preference. 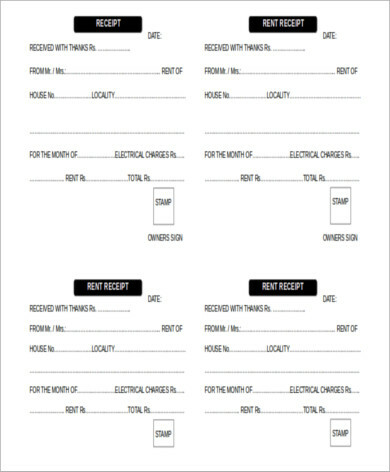 Once you are done editing the template, you can start printing these and manually fill out all the details, or you can also save your edited template to your computer and fill it out before you print it. You may also opt to check out Sample Payment Receipts.